magnetization and cracking catalyzer or carrier of catalyzer of the petrochemical,dehydration and decontamination of petrochemical,dehydration and purification of the refined industry,reverted application of hydrocarbon,dryness of industrial gas/air decontamination,dryness and decontamination of natural gas,abruption of chemical industry,carrier of essence or aroma,dampproof drier for packing,household air freshener and odorant removing agent and stuff for pet. Silica gel is a kind of high-active absorbing material, which is generally obtained by reaction of sodium silicate and sulfuric acid together with aging, acidic soaking and other series of post-processing. 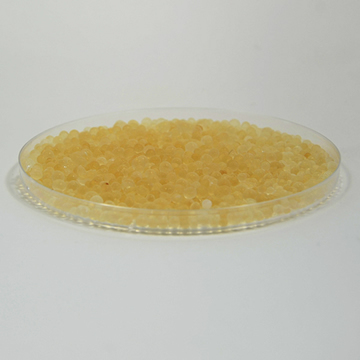 Silica gel belongs to amorphous substance and its chemical formula is mSiO2 . H2O. With stable chemical property, it won't burn and won't dissolve in any solvent except for alkali and hydrofluoric acid. 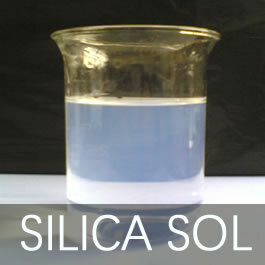 Silica gels of various models form different fined-pore structures owing to different manufacturing methods. 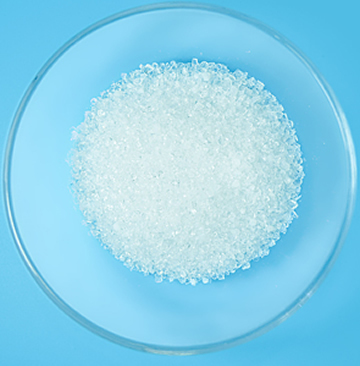 Additionally, the chemical components and physical structure of silica gel determine that silica gel owns many characteristics which can't be substituted by other materials of same kind, such as high absorption performance, excellent thermal stability, stable chemistry, high mechanical strength and others. 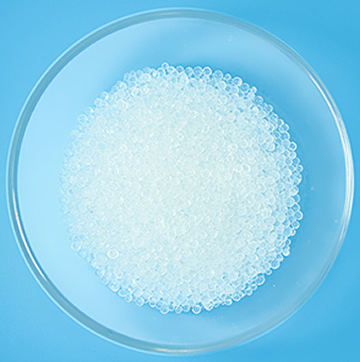 This product is a water-resistant silica-alumina gel with fine pores. 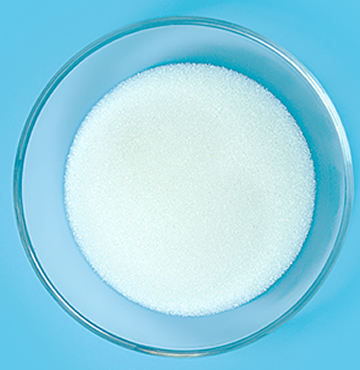 It is usually used as protective layer of fine-pored silica gel or fine-pored silica- alumina gel, and can be used solely when dissociated water(1iquid water)is in high content. Lower dew point can be true when liquid water exits in system. 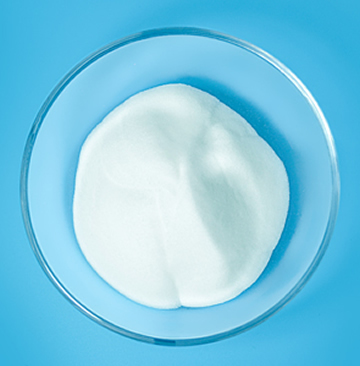 It is mainly used as drying agent for air-separation, compressed air and industrial gases, as ethyne absorbent for preparation of liquid oxygen or liquid nitrogen and as liquid absorbent or catalyst carrier in oil chemistry, electricity and brewery industry, especially used as protective layer of common silica gel and silica-alumina gel. 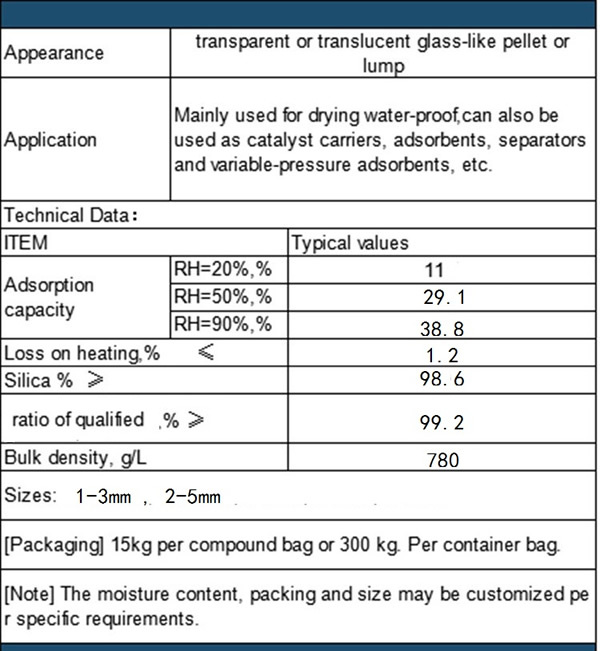 About 20%(wt)should be the percent when used as protective layer. Orange silica gel development and the development based on the original blue rubber indicator, it use the new non-toxic compound coloring agent, fundamentally eliminated the coloring agent the pollution which creates to the environment. The product becomes the new generation environmental protection class product by its original creation's processing technology condition and the good adsorption performance. 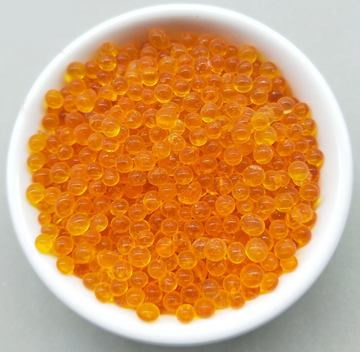 The orange silica gel may widely apply in the aviation, the armed forces industry, the high-rise construction, the electric power industry, the goods moisture-proof, civil and so on various domains. 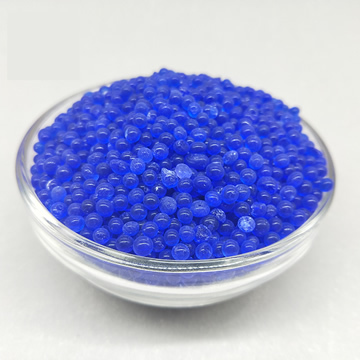 Composed of blue gel indicator, allochroic silica gel and blue gel, blue silica gel performs as blue or light blue glasslike particles in the spherical or lumpy shape. It will change its color from blue to red after absorbing moisture. 1. The gel is mainly used for absorbing moisture for apparatus, instruments, and equipments in airproof condition to avoid them from rusting, and indicating the environmental relative humidity due to its obvious color change. 2. 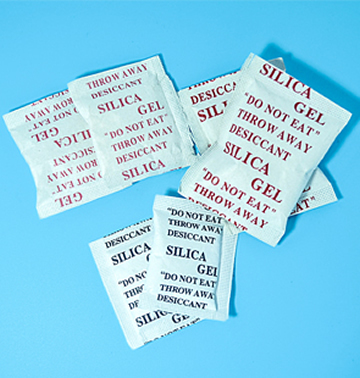 The gel is mainly used for indicating desiccant’s absorbing degree and environmental relative humidity by being mixed with common silica gel in proportion. 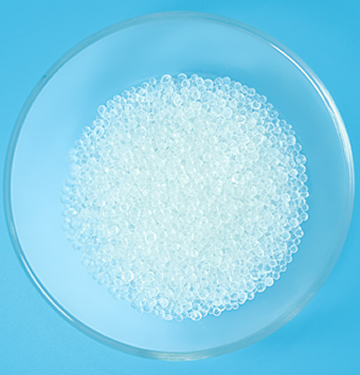 Besides, it is also widely used in precision apparatus, leather, shoes, garment, food, drug and household electric appliance industries as silicon gel desiccant. Aeailable in forms of thin layer chromatography silica gel plate, high efficient thin layer chromatography silica gel plate. They are formed of fine quality thin layer chromaotography silica gel blended with proper adhesive and applied on the glass plates. It has specified pore volume, specific surface area and pore distribution. Can be used directly for quick separation of many types of organic substances--for qualitative or quantitative analysis, it has also been widely use for examining the small amount of impurites and the main ingredients in medicines, pesticides, Chinese herbal medicines, organic chemical products, cereals and foods. 1.White grains of homogeneous size. 2.main ingredient is silicon dioxide.Of high purity. 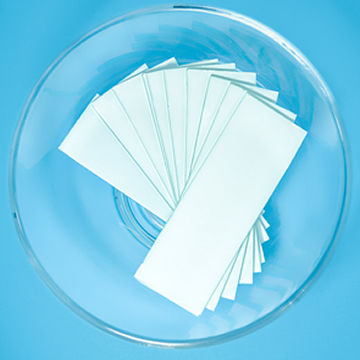 White grains of homogeneous size.Chief ingredient is silicon dioxide.Of high purity.Secure and Sanitary.Can be used to separate and refine mixed components because different components have different absorption duration on this silica gel. For refinement of petrol products, removal of aromatic hydrocarbon material, separation and refinement of traditional Chinese herbal medicine components, preparation of high purity substance,etc. 1.Improve the resistant compression,break resistant, impervious,anticorrosive,impact resistance and wear- resisting property. 2.Water retention,prevent segregation reduce pumping resistance of concrete. 3.Remarkably prolong the service life of concrete. 4.lower the cost and improve durability. 1.Used in mortar and concrete. 3.Walling materials and finish material. steroids, amino acids, dyes, alkaloids, phenolic compounds and pharmaceutical intermediates. 1) Analysis and purification of pharmaceutical, chemical intermediates. 2) Processing of the spring crude specialintermediate. insoluble in aides ( except for hydrofluoric acid) soluble in caustic alkali solution. 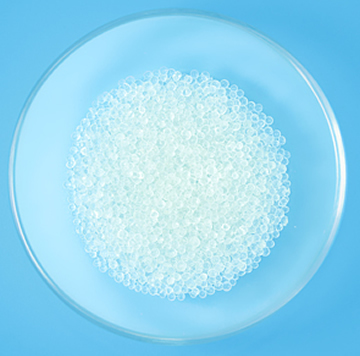 compared with silica gel, it cotaines more hydrosyls and is a kind of high-purity reagent silica gel. Mainly used for cjemial reagents, fusion agent for processing tungsten fulaments. Packing: 500 g net per plastic bottle. Silica gel with fine pores includes spherical silica with fine pores and massive silica with fine pores. Spherical silica with fine pores has the appearance of colorless or yellow-transparent or translucent spherical particle, massive silica with fine pores is a colorless or yellow translucent glass-like irregular particle. The average diameter is 2.0-3.0 nm, ratio surface area is 650-800 m2 / g, pore volume is 0.35-0.45 ml / g, ratio heat 0.92 KJ / kg. °C, thermal conductivity coefficient is 0.63 KJ / m. Hr.°C. 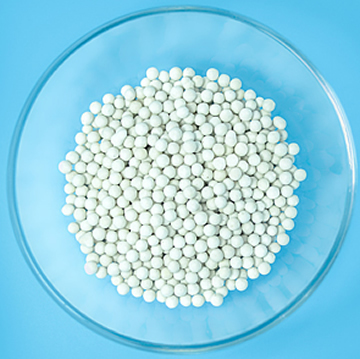 Note: Qualified ratio of spherical granules is only applicable to fine-pore silica gel. [PACKING] 25KG per bag or 500KG per bag. 2 Color:milky white, transparent or translucent. 5 Specific surface area: 450-650m2/g. 6 Structure lying between macro-pored and fine-pored silica gels. 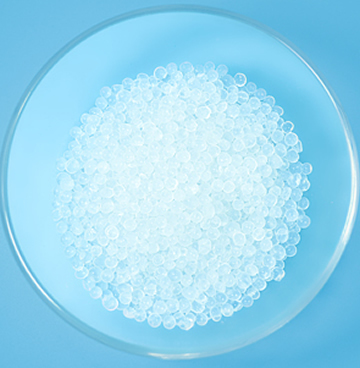 Silica gel type B is milky white ,transparent ang translucent pellets or lumps ,mainly is used as liquid adsorbent, desiccant and fragrance carrier, also can be used as catalyst carrier, cat sand, etc. mainly used for air humidity regulator, catalysts and carrier, and used as silicon gel chromatography of fine chemical products of raw material. 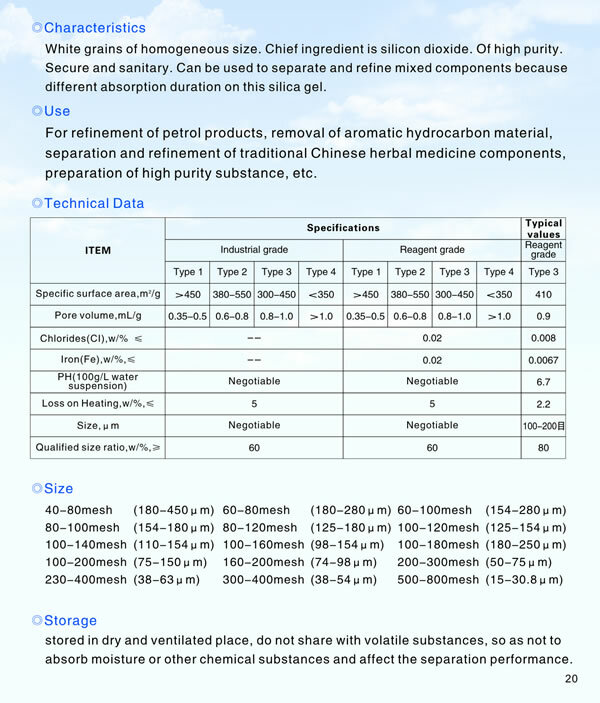 Thus desiccant is widely used in the instrument and meter, and instruments, leather, footwear, bags, textile, food, and medicine, storage and transport of the relative humidity control environment, prevent moisture items, mildew and rust. It to package the technical indicators and desiccant for inspection, testing methods have clear rules. The safety performance of the silica gel, silica gel has the very strong adsorption ability, to the person's skin can produce dry effect. 5. used as catalysts and catalyst carriers, etc. 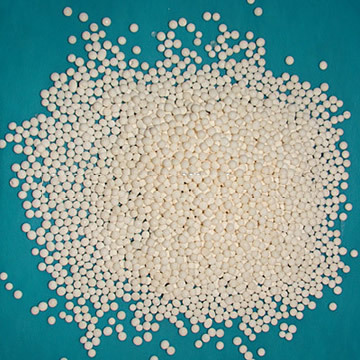 It is a kind of non-crystalline micro-porous solid powder,its pore diameter is 8-16nm.Its chemical molecular formula is mSiO2.nH2O,insoluble in water or any other solvent (except the caustic alkali and hydrofluoric acid). It does not react with any acid, alkali or salt. It is nontoxic, tasteless,flame-resisting and nonexplosive.It possesses high stability under hot or cold atmosphere and is harmless to human body,mainly used in beer industry. 1. It has large specific surface area and numerous fine-pored structure.It adsorbs the proteins which cause beer turbid and removes them through filtering,just within several minutes,thus prolonging beer storage period by 180-240 days and keeping beer from being cold muddy. 2. It does not affect the beer foam or taste.Thanks to its superior physical and chemical properties,it does not have any adverse effect on the beer foam or taste.It generally recognized by the world beer industry. Mainly used for drying water-proof, can also be used as catalyst carriers, adsorbents, separators and variable-pressure adsorbents, etc. Processed and formed from powders. Besides the adsorption feature possessed by ordinary silica gel, FNG silica gel possesses good water-tolerant property, low break-down rate of reclamation and long service life, etc. Mainly used for air drying in the air separating process, the adsorption of acetylene in preparation of liquidified air and liquidified oxygen. 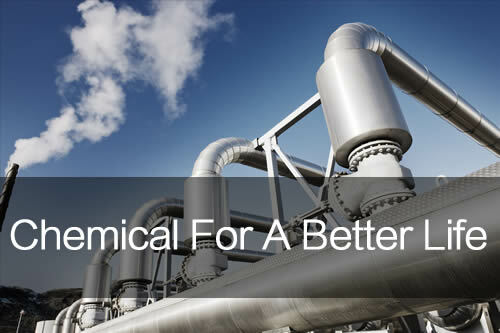 It is also used for drying compressed air and various industrial gases. 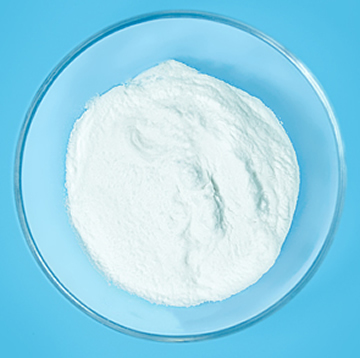 In petrochemical industry, electric power industry, brewing industry and other industries, etc., it is used as liquid adsorbent and catalyst carrier. It may also be used as the buffer drier, silica sand etc. for ordinary silica protective bed. [Packaging] 20kg or 25kg per compound bag, 500kg per container bag. [Notes] packing and size may be customized per your specific requirements. good thermal stability, high mechnical strength. 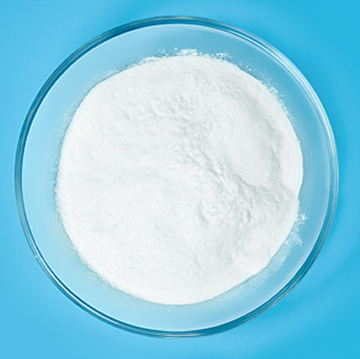 Used as catalyst or catalyst carrier in the manufactuing of hte important induwtrial products, such as cyanuramide, benzene anhydride, maleic acid anhydride, butadiene rubber, acrylic nitrite, etc. Nontoxic, tasteless , safe and clean, having strong drying and anti-mildew effects. the first of its kind made in china for medical and food purposes. Used for moistureproof of bottled medicines and foods to make the articles contained dry and avoid the rowth of a variety of mildews. Used as drier in ordinary packing for mostureproof. Packing and specificaiton maybe customized per you specific requirements. @Copyright 2006 Shenulon Chemicals Imp. & Exp. Co.,Ltd. All Right Reserved.